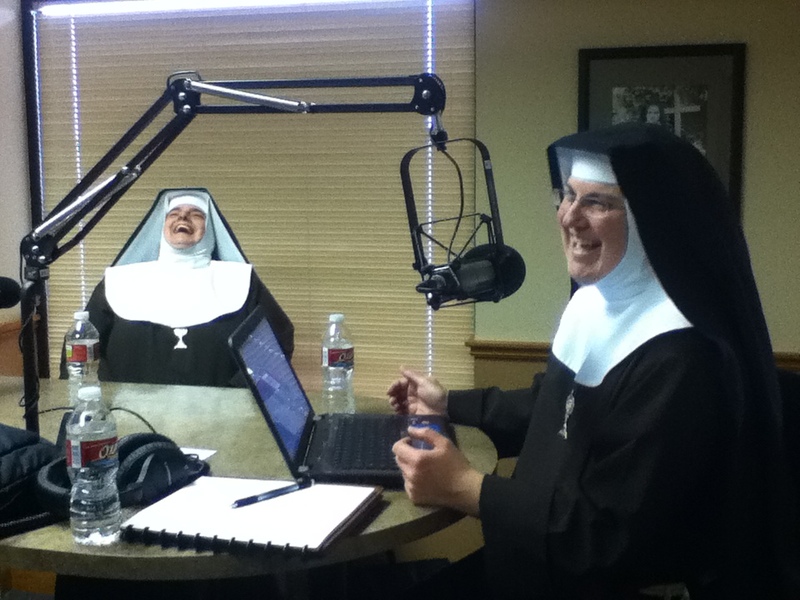 Yes, nuns on the radio! Yesterday we spent some time at the Guadalupe Radio Network studios prepping for our new weekly live show, A Good Habit. It debuts this coming Wednesday, May 1st, at 1pm. We hope you’ll not only tune in, but call in (check the widget on the sidebar, or go to our show page for email and phone info), as we’ll be devoting part of each show to your questions about our life. We hope our show will be something like this photo, infused with the joy and laughter we try to bring to each person we meet. This coming Monday we’ll also be dropping in on Richard Reyna’s noon show, Rise and Walk, (click here to listen to the podcast in itunes) to chat a little about A Good Habit. This entry was posted in A Good Habit and tagged A Good Habit, Guadalupe Radio Network, radio, Richard Reyna by texasnuns. Bookmark the permalink. Awesome show! I came to the website to subscribe to a newsletter or anything! I love your voices! Keep it up! God bless you! Hi Sisters! Great first show! Loved the opening music, a real attention-grabber! Really enjoyed the segment on St.Joseph…I’ve been sending the men in my family off to work, and play, with a prayer to him for years – he never disappoints! I’ll be ordering more Nonnavita soon, great gift for Mother’s Day, or any day! Ditto for what Linda said! Except my lunch half hour ends even earlier, around noon. Maybe some Wednesdays I’ll not be answering the phone and can listen to you. I caught some of today’s show, and was laughing hysterically! So very glad you’re here in Texas and so thrilled you’ll soon be on the air. Mother must be so proud!!!! I’m so very happy for you, Sisters! What a wonderful gift you’ll be giving to your audience. Since I’m many, many miles away, do you think I’ll be able to access the show via the Internet? This is such exciting news, and I really don’t want to miss out! God Bless! Wow! I’m looking forward to your show! Hope that it is the start of a great new path of evangelization dissolving apathy and stimulating women to explore the possibility of Gods call to religious life! I will always be tuned into your radio program learning from you all. Let us know how we can support you. SO proud of you sisters!!! Check out the radio show page on this blog for info and links to listen to A Good Habit any time. Thanks for your encouragement – and so glad you like Nonnavita!